News arrives overnight from the Fort Lauderdale office of Yachtzoo that they've listed a new(ish) 25.9m Marlow 85 motor yacht for sale. Delivered earlier in 2011 by Marlow Yachts, her twin 1900hp Caterpillar engines have very low hours and her planing hull gives her a cruising speed of 25 knots and maximum speed of 30 knots. Accommodation is for up to 10 guests in four staterooms and she comes with full warranties. 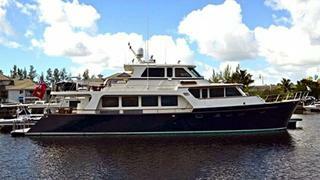 The Marlow 85 is asking $4.295 million and is available for inspection in Fort Lauderdale.